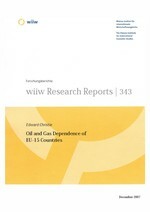 This study seeks to answer two questions: first, which countries and industries within the EU-15 group of countries are most vulnerable to possible supply shocks with respect to crude oil and with respect to natural gas and, second, what is the current state of the EU's debate on Europe's energy security. The most vulnerable countries with respect to petroleum products are Finland, Belgium and Greece, while the most vulnerable countries with respect to natural gas are Finland, Austria and Italy. The least vulnerable countries in both cases are first and foremost those with currently high North Sea extraction levels such as the UK, Denmark and, in the case of gas only, the Netherlands. Leaving those countries aside (while bearing in mind that their resources are running out), the least vulnerable countries are Spain and France in the case of petroleum products, and France and Ireland in the case of natural gas. The focal point of the EU's energy security debate is its relationship with Russia and the Russian gas monopoly exporter, Gazprom. The EU is already quite strongly dependent on Russian resources, and this dependence is set to rise if current trends continue. Furthermore, Gazprom's very active corporate expansion strategy, both downstream within the EU and upstream in Central Asia and elsewhere, further heightens the EU's energy security problem. The European Commission, which was previously seeking to achieve a fully competitive internal energy market through unbundling of supply and distribution, has responded to this challenge by proposing new legislation that would effectively impose unbundling on EU companies and on non-EU companies that operate inside the EU, Gazprom included. The legislation that the European Commission proposes is, from an economic point of view, possibly the best response to the EU's current energy challenges. It would limit (and, in theory, possibly reverse) Gazprom's downstream penetration in the EU, in addition to contributing to a better functioning of the EU's internal energy market. Moreover, the Commission's approach implicitly leaves an open door for Russia to choose between a first-best solution and a second-best solution with respect to EU-Russian energy relations. If liberalization were to occur bilaterally, both entities would be able to invest in each other's energy markets, leading to improved efficiency and security for all concerned. If Russia were to refuse, the EU would have in place a mechanism that would enable it to prevent Gazprom from entering the EU's downstream market, thus contributing to improving the EU's energy security at the expense of Gazprom profits.